Khosla Machines Private Limited was set up in 1983 by Mr. Rajesh Khosla, a Design Engineer by profession with Post Graduate Degree from IIT. The first machine developed by the firm was a detergent bar wrapping machine using a unique mechanism of wrapping that made the machine simple in design and yet capable of fairly high-speed operation. Being the first of its kind and the only indigenous wrapping machine for this application it was a big success. HUL and Nirma were the notable early customers of this machine. 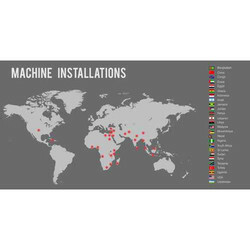 Over the years a large number of new machines and newer models of existing machines for diverse market segments were developed to meet the growing expectations of the customers. With the growth of business came to the growth of infrastructure and refinements of systems to meet the production complexity of producing a huge diversity of machines and their components, increased quality expectations, timely deliveries and efficient after sale service.Khosla Machines now have a combined 70,000 Square feet of workshop area and in-house production capacity of latest 3 -D Laser, multi axes CNC press Brake and VMC'c. A sizeable part of the production is outsourced to handpicked vendors, some of them associated with the company for last three decades, having the latest technology to manufacture components to the exacting quality standards of the company. There is a 100% quality check of the component before it is laser marked and entered into the storage system. The entire production system is controlled by a customized ERP system from Microsoft. To serve a customer base spread over 28 countries there is a strong service team with a good bench strength. Most of the service engineers have more than ten years of hands- on experience. The process is controlled by a CRM system. We export our Products "Globally". The fountainhead of the machine development is the design center that has 25 patents to its credit many others in pipeline). Khosla Machines has got coveted recognition for in house R&D by Govt. of India, Ministry of Science and Technology. The Company encourages customers to think about line solutions in association with their design engineers. To strengthen our position in this highly competitive packaging industry by persistent qualitative and functional innovation. To upgrade the quality of machines through implementation of innovative technologies pertaining to the quality of machines and their overall management. Our guiding philosophy is "Listen Innovate. Deliver". At Khosla. we believe that sale of a machine is the start of a relationship with a customer. Khosla maintains close linkage with its customers for continuous feedback, as well as to know and understand the unique requirement of its every customer. The versatility and conviction in product improvements through continuous improvements in design and R&D have made us widely accepted in the norms packaging industry. We implement stringent quality conforms every stage of the manufacturing processes. Over the years, we have built up a strong supplier chain including a number of suppliers of international repute and also have more than 20 patents under our belt. Khosla machines are innovative, reliable and precise. Customers appreciate the 'Jumper it's guarantee to manufacture and quality machines. As an industry leader for the last two decades. Khosla balance sheet and financials are impeccable and sales are climbing. Khosla financial success enables it to invest significant resources in ongoing product development. Khosla strongly believes that:Their customers have the best machinery at reasonable prices. 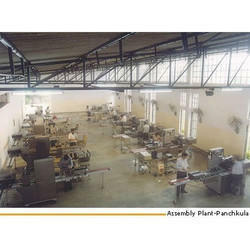 Khosla lives by its maxim 'Great Value Packaging Machinery". Khosla's service and spares cost also endorse this. Khosla knows your industry and the trends that drive growth. It also knows packaging lines. enabling you to focus on your UM cure competency. From commissioning to after-sale support. Khosla provides committed project management that meets your requirements on time. The modern assembly plants located in Mohali, Panchkula and Baddi are well equipped to manufacture the well-designed machines. Trained manpower with years of experience back up and rigorous in-house quality control measures ensures a high standard of quality of machines. The production is done under the direct supervision of high qualified technical experts who monitor every stage. Khosla Machines Manufacture a complete range of industrial food packaging machines since 1995 and have created a niche in the soap industry for its quality, well-designed products and innovative engineering. 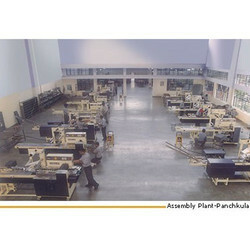 Khosla Machines has earned the reputation for offering customized solutions to its valued customers through engineering excellence for maximum productivity, profitability and speeds. Khosla Machines have received commendations from its satisfied customers for delivering cost-effective solutions to many challenging packaging needs. 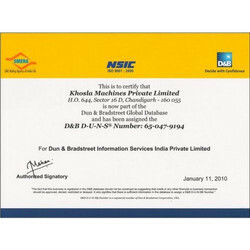 Khosla Machines Private Limited is located in Mohali and Khosla Precisions is located in Panchkula, both satellite cities of Chandigarh, India. We specialize in industrial food packaging machines, wrapping machines, banding machines, bundling machines and flow wrap machines in various formats. 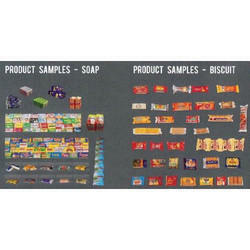 Khosla offers specialized machines for the following segments Soap Packaging Machines, Biscuit Packaging Machines, Paper Packaging Machines, etc. Khosla has the privilege to be associated with some of the world renowned companies including Hindustan Unilever Ltd., Reckitt Benckiser, Henkel, P&G, ITC, Wipro, Nirma Ltd., Parle, Britannia, Dukes, Bonn, Creambell, J.K Paper, Trident Group. The company is R&D oriented and constantly innovating. Company holds numerous patents for its designs. You can discuss your specific packaging requirement with our team of highly experienced engineers for customized, cost-effective solutions. Khosla's objective is to strengthen our position significantly by increasing our presence in the packaging / wrapping machinery markets. Khosla differentiates itself from the competition with its ability and flexibility to adapt to each customer's specific requirement, as well as our versatility in making quick changes in the packaging sector. Over the years the company has built up a vendor base including suppliers of international repute having their operations in India. Khosla Machines are guided by the philosophy, 'Service before Sales'. Khosla believes that sale of machine is start of a relationship with a customer. 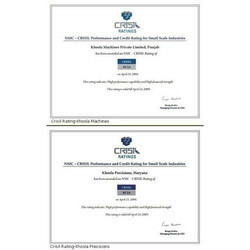 Khosla maintains close linkage with its customers for continuous feedback, as well as to know and understand the unique requirement of its every customer. Each service engineer is handpicked within the team after rigorous training. Normally any service engineer from Khosla would have a minimum experience of 8-10 years. In case of need, the service engineers at Khosla are always ready to reach out to its customers anytime, anywhere in the world.